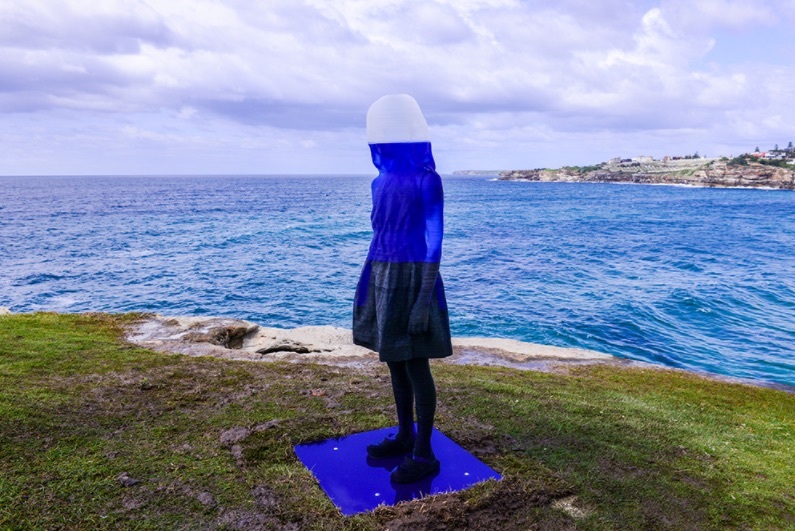 As if the coastal walk from Bondi Beach to Tamarama Beach in Australia wasn’t picturesque enough, more than 100 sculptures by artists from around the world have been adding to the area’s beauty as part of the annual Sculpture by the Sea event. One particularly striking example of the works is a translucent layered sculpture by Italian-born artist Alessandra Rossi called Untitled (coral). Rossi’s piece was inspired in part by the troubling phenomenon of coral bleaching, which renders coral white and vulnerable to disease as a result of losing its main food source, algae. Coral bleaching occurs when waters become too warm. In Australia where Rossi is now based, coral bleaching has been increasing and can be devastating to the aquatic environment. The other inspiration for Rossi’s piece is from a more interpersonal, human level. From far away, the tiered sculpture almost appears to be made of smooth, sleek glass, but it is actually a 3D printed acrylic material. Up close, the girl’s figure and dejected-looking face are pixelated, which is meant to create a discussion around the emotional effects of technology and digital media in modern times and how they are influencing identity. The sculpture’s appearance changes throughout the course of the day, with the colors varying depending on the angle at which visitors are standing as well as the light passing through it. According to Rossi, the piece can be seen “as a metaphor for the patination and discoloration of emotion engendered by the digital era.” While Untitled (coral) is beautiful to look at, its allure goes beyond its changing surface. It accomplishes what art is intended to do: get its audience thinking on a deeper, more meditative level about the world around them. It’s hard to look at Rossi’s sculpture without thinking of the way that we can all disappear into a virtual world, ignorant or stubborn to observe what is occurring around us. As if the coastal walk from Bondi Beach to Tamarama Beach in Australia wasn't picturesque enough, more than 100 sculptures by artists from around the world have been adding to the area's beauty as part of the annual Sculpture by the Sea event. One particularly striking example of the works is a translucent layered sculpture�by Italian-born artist Alessandra Rossi called Untitled (coral). Rossi's piece was inspired in part by the troubling phenomenon of coral bleaching, which renders coral white and vulnerable to disease as a result of losing its main food source, algae. Coral bleaching occurs when waters become too warm. In Australia where Rossi is now based, coral bleaching has been increasing and can be devastating to the aquatic environment. The other inspiration for Rossi's piece is from a more interpersonal, human level. From far away, the tiered sculpture almost appears to be made of smooth, sleek glass, but it is actually a 3D printed acrylic material. Up close, the girl's figure and dejected-looking face are pixelated, which is meant to create a discussion around the emotional effects of technology and digital media in modern times and how they are influencing identity. The sculpture's appearance changes throughout the course of the day, with the colors varying depending on the angle at which visitors are standing as well as the light passing through it. According to Rossi, the piece can be seen "as a metaphor for the patination and discoloration of emotion engendered by the digital era." While Untitled (coral) is beautiful to look at, its allure goes beyond its changing surface. It accomplishes what art is intended to do: get its audience thinking on a deeper, more meditative level about the world around them. It's hard to look at Rossi's sculpture without thinking of the way that we can all disappear into a virtual world, ignorant or stubborn to observe what is occurring around us.